According to the report's worst-case-scenario prediction, Sub-saharan Africa could see as many as 86 million internal migrants, South Asia could see up to 40 million, and Latin America could see 17 million. The climate-change effects most likely to force migration will be drought, crop failure, sea level rise, and increased storms. 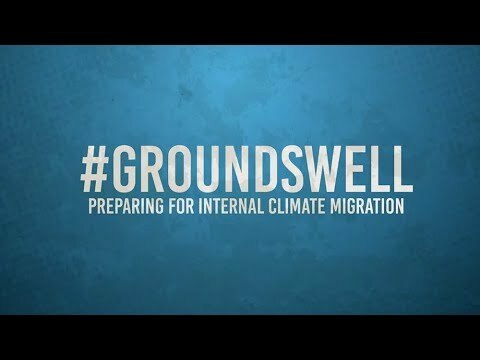 But the report also found that swift action on the part of governments to limit greenhouse gas emissions in time and develop plans to help populations in vulnerable areas could reduce the number of migrants by 100 million. "We have a small window now, before the effects of climate change deepen, to prepare the ground for this new reality. Steps cities take to cope with the upward trend of arrivals from rural areas and to improve opportunities for education, training and jobs will pay long-term dividends. It's also important to help people make good decisions about whether to stay where they are or move to new locations where they are less vulnerable," Word Bank Chief Executive Officer Kristalina Georgieva said in the release of the report. The report also offers case studies of how governments and non-governmental organizations might plan effectively for migration or help populations live sustainably in rural areas. Bangladesh, a low-lying country where agriculture is vulnerable to floods and salinization, could end up accounting for one third of South Asia's climate migrants. The Word Bank highlighted the case of Monoara Khatun, who left her village of Kurigram due to flooding, moved to the capital city of Dhaka, and enrolled in the World Bank's NARI project, which provides women with training, accommodation and work placement. The program allowed her to earn enough to support herself and her family, and represents an example of the type of project that could help urban centers prepare for an influx of vulnerable newcomers. For an example of a program that could help people in rural areas find climate-resilient opportunities, the World Bank held up sustainable forestry programs like one in Oaxaca, Mexico. Because of the program, 26-year-old Javier Martinez was able to stay in his home and grow the carpentry business he runs with his brother. "At the forest level there is employment, in businesses there is employment, so there is not a strong need to go away, because in the community there is a wide range of opportunities," Martinez told the World Bank.